One of the minor manifestations of the prevailing Teutonic spirit which led to the Great War is to be found in the invention of a comparatively new phrase and its constant use by those who were directly responsible for the War in the period preceding its outbreak and throughout the whole of its duration. The phrases - "the Will to Deeds" (der Wille zur Tat), "the Will to Might,'; "the Will to Victory,"' "the Will to Unity," even "the Will to Defeat," or, as ascribed to their enemies, "the Will to Destruction," occurred in nearly every pronouncement or speech made by the Kaiser, his statesmen and generals since 1907. The form in which it has hitherto been used-and rightly used-is to govern some verb expressive of the definite activity arising out of the will or directed by it. We thus have a will to act, to rest, to work, to play, to fight, to give in, etc. It clearly denotes that one of our several faculties is directed towards a definite action; the more definite and individual the action, the more clearly does this human power manifest its nature and strength and the clearer is the meaning conveyed; the vaguer and more confused, general and abstract, the less clear becomes the meaning to be conveyed, until it ends in nonsense. Thus we may have a will to fight, and we generally do fight to win; but we do not add to the clearness of expression by maintaining that we are generally moved by the "will to victory." The phrase is raised to the dignity of a metaphysical principle, however much it may be flattened out and lowered down to the practical use of the market-place, the political stump speaker's platform, the barracks' drillyard and the world's battlefields. As a matter of fact,it has its primary, though more remote, origin in the metaphysics of Schopenhauer, the title of which is Die Welt als Wille und Vorstellung. In Schopenhauer's system the word "will" conveys the widely metaphysical meaning corresponding to force, to emotive power in some degree cognate to the ancient Greek Hesiodic conception of Eros or Love (not the later boy-Cupid), the oldest of gods, the force out of which the world grew. Still more remote and more vaguely influential was the Hegelian conception of the State as a fixed and final entity in the life of humanity, above reason and morality, which to some degree led to the establishment by German publicists of their conception of the State and to the rule of German Politismus by publicists and political writers. But, in the conception of will in the phrases as used by the Kaiser and his learned or unlearned henchmen, his own will or the will of the State and the German nation was divorced from reason, justice and charity, as the State and the sovereign are supreme and are raised above morality. Might becomes right, and the "will to might" is the dominating principle of State action and of the citizens composing the State. These principles embody the latter-day system of morality dominating the political and social life of the German people, which led to this War and which established the barbarous methods by which it was carried on. They differ as much from the principles regulating the life of the older Germany as the ethics of Kant differ from those of Nietzsche. It required nearly fifty years for the Nietzschean ethics to percolate to such a degree through the moral consciousness of the German people, and for the German publicists, writers and teachers to pave the way for the Kaiser with his bureaucrats and militarists to advance to those heights of popular influence from which he could make the most definite practical application of these principles in order to lead Germany to world-dominion. It is possible to fix the exact date when, by supreme sanction of the Over-Lord, they are used as a watchword for the political regeneration of his people and for the establishment of Pan-Germanism throughout the world. The first time the Kaiser used such a phrase was in his Speech from the Throne at the opening of the Reichstag in February of 1907. His peroration ran thus: "And now, gentlemen, may our national sentiment and our Will to Deeds (Wills zur Tat), out of which this Reichstag has sprung, also dominate its work for the salvation of Germany. " The Kaiser's use of the phrase is thus the first application of this more or less philosophical term for definite practical purposes in the political life of the German nation. The date 1907, when taken in connexion with the general trend of international politics of those days, is most significant. "The Day" (der Tag) was already a watchword in the Army and Navy. From that time onwards it recurs again and again in German political speeches, especially in reference to the foreign policy of the German nation and its need for expansion; until, during the period immediately preceding the War, and also during the War, hardly any speech has been made by the civil and military authorities without the obtrusion of some reference to the " Will to war," "to victory," "to power," etc. The forging of this term, first used in Nietzsche's Richard Wagner in Bayreuth (1876), was beyond all question influenced by Schopenhauer's Die Welt als Wille und Vorstellung." No doubt one of the most influential factors in familiarising the German people with the philosophy of Schopenhauer was the widespread popularity of Wagner's Music-dramas, especially The Ring of the Nibelungen. Wagner was, during the greater part of his life, a direct and convinced disciple of Schopenhauer, and consciously embodied the leading principles of his philosophy in his own artistic creations. The central figure of Siegfried ("who knew not what fear meant") as a personification of will-power, the only force which rules life, represents his conception of Schopenhauer's Will. Schopenhauer's use of the term "will" and, even in its application to human life, the phrase " the Will to Life" (der Wille rum Leben), partake more of an abstract and metaphysical significance. In Nietzsche, however, it is directly concerned with man's social and moral attitude towards his fellow-men, and aims at becoming a direct and fundamental guide to moral (or, rather, unmoral) human existence. With him the phrase is essentially connected with his theory of the Superman. This term, so much used of late years in every part of the world, did not originate with Nietzsche. In fact it goes back to the ancient Greek poets, to Homer and Hesiod and to Lucian. In Seneca we have the phrase "supra hominem est." In German the term " Uebermensch," besides occurring in the writings of Hippel, Jean Paul, Grabbe, and others, is found in two famous passages in Goethe's Faust. Goethe probably derived his use of the term from Herder, who again borrowed it from the numerous theological writers of the seventeenth, eighteenth and nineteenth centuries. These theological writers used the term in a very different-in fact, in an opposite, significance to that attached to it by Nietzsche. The term Superman has only become a commonplace in the modern sense through Nietzsche, who sees in him a forceful being to whom nothing is good but what he wills and who overthrows ruthlessly whatsoever opposes him. No doubt the conception of "Rulersmorality" and of the "Blond Beast" was introduced by others. Nietzsche himself saw in the Superman only a higher ideal step made by humanity, which was thus to develop in the same degree as is found in the step from animal to man. Nietzsche in his Essay Beyond Good and Evil (1886), where he asserts that there exists " a morality for Rulers, and a Morality for Slaves" (Es gibt Herren-moral und Sklaven-morat); and further maintains that "morality in Europe is to-day the morality of herded animals " (Moral ist heute Herdentier-moral). Furthermore, in his Essay on the Genealogy of Morals (1887) (probably influenced by de Gobineau), he refers to the "need of all aristocratic races " to compensate themselves for the social constraint, which in times of Peace they must impose upon themselves, by means of cruelty to other races; and thus, as exulting monsters, to return to the innocence of the predatory animals (Raubtier Gewisseri), as the glorious "Blond Beast," lustfully roaming about in search of prey and victory; and this term of the Blond Beast especially refers to the German nation as that of the Blond Germanic Beast (Blonde Germanische Bestie). Probably best known among the captured German films is the full-length version of "Triumph of the Will," which has been the object of repeated, and often intensive, study by students from many disciplines. Directed by Leni Riefenstahl for the National Socialist German Workers' Party, this film remains a monumental record of the 1934 Nazi Party rally in Nuremberg, spectacularly staged by the Nazis with the future success of this film in mind. Brilliantly edited, it captures some of the intangibles of Nazism: its idealism, its mystique, and the personal charisma of Hitler. The film on the 1933 Party rally, Sieg des Glaubens (Victory of Faith) glorified S.A. leader Ernst Röhm. He is seen sharing whispered conversations with Hitler, he is the only person Hitler addresses with the familiar du form, he is at Hitler's side during a major parade, and he is seen in closeups with Hitler. A new film had to be made because Hitler had all prints of Victory of Faith destroyed after he ordered the murder of Ernst Röhm, his right-hand man in that film, along with hundreds of other S.A. officers, on June 30, 1934, "the night of the long knives," just two months before the next party rally. At the 1934 Nuremberg party rally that Leni Riefenstahl memorialized in Triumph of the Will, Minister of Propaganda Joseph Goebbels said that propaganda has "to win the heart of a people and keep it." Riefenstahl had invented the photo opportunity, the event which occurs in order to be visually recorded. When an event is staged with full consciousness of how it will look on film, how "real" is its reality? Albert Speer in Inside the Third Reich recalled the studio restaging of a speech by Rudolf Hess. 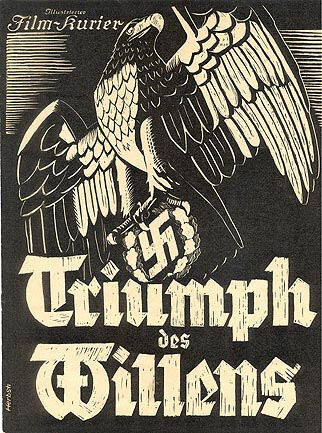 Although the event itself may have been staged, "Triumph of the Will" is a revealing document about the nature of the Nazi regime. Hitler'sfanaticism and twisted German nationalism are effectively conveyed by sophisticatedartistic rendition. "